Acclaimed visionary author Kim Stanley Robinson is a Hugo and Nebula Award-winner. 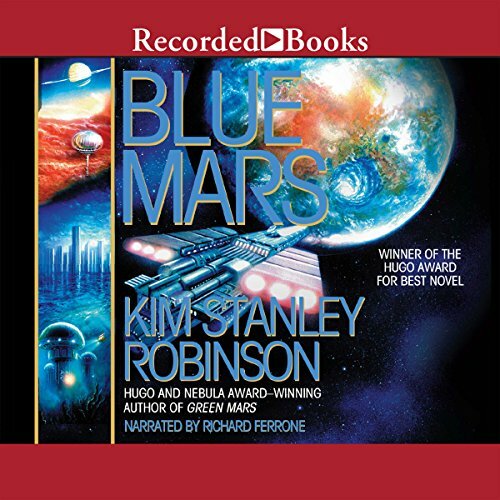 Blue Mars is the final volume in Robinson's seminal science-fiction trilogy, which began with Red Mars and continues with Green Mars. Meanwhile, across the void of space, old, tired Earth spins on its decaying axis. A natural disaster threatens to drown the already far too polluted and overcrowded planet. The people of Earth are getting desperate. Maybe desperate enough to wage interplanetary war for the chance to begin again. Blue Mars is a complex and completely enthralling saga - as convincing and lushly imagined a future as anyone has ever dreamed. Richard Ferrone narrates this sweeping epic with engaging personality and finesse. As is the previous 2 books, Ferrone's performance has no emotion or enthusiasm. The only real problem with this book is when it jumps forward in time, it doesn't tell you the date. It covers over a century, jumping decades at a time, without tell the reader/listener where you are. Really enjoyed the first book. Second book started wearing on me. Third book just gave me more and more of what I didn't want. The original 100 should have died in the first or second novel. The characters were a bit old to even start the journey (50's) in my opinion. The author then creates a way for these characters to continue living on and on to pollute Mars for all future Earth immigrants. The unbelievable thing is that these militant terrorists/scientists are willing to let the most caustic and opposition characters live on. Ann would've been assassinated like 80 years prior to the end of the story. Killing thousands of humans so that the rocky landscape can remain? Not buying it. I single out Ann as she is my least favorite. 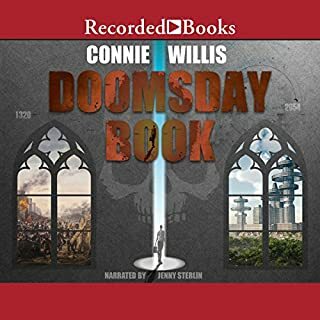 It is a well written series and narrated well. The technology is done very well for 90's writing; doesn't feel unimaginative like other SciFi written in earlier decades. I don't agree that most of the personnel selected to establish a Mars colony would be terrorist minded and anti human in environmental policy. Makes for nonsense drama throughout. Anyhow. I was able to finish. There is that. This is a pretty darn good series, though a bit preachy, it has a good story line and it is told in a fresh manner. The only suggestion I have is that the narrator purchase a dictionary so that when a word he is ineasy with can be pronounced correctly. First, as this is an audio experience, thank you to Richard Ferrone for an inspired performance. The series is 60 plus hours long and his engagement never falters. Second, the characters, science, and story arc form a masterwork. Kim Stanley Robinson takes us to a future worth the monumental work and heroism it will take to get there. Third, this is a really fun read. Savor the journey. Excellent finish to a great series. No chapters? 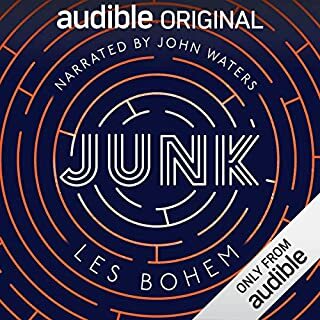 I read this series 20 years ago and it was great to hear it. 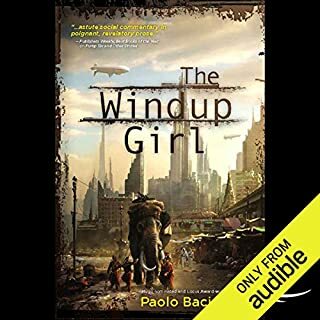 But Audible why? This piece of work has no chapters or time code of any kind. 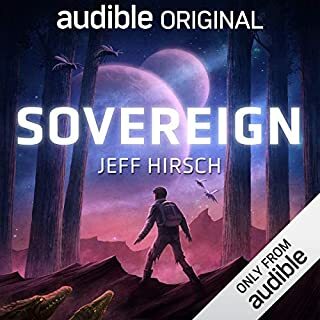 I know there could be licensing stuff and it wasn't originally made for Audible but why isn't it broken up into segments of any kind? The entire time I was listening there was no way to know how much time was left, or how long I had listened! That made it so frustrating! I lost my place once and had to go back in 30 second jumps dozens of times to get back. What a mess! 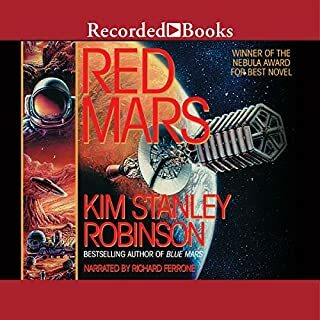 Kim Stanley Robinson's Blue Mars is the final installment in his colorful Mars trilogy (Red - Green - Blue). Events pick up immediately after the end of book 2. Mars is split along red / green lines, while Earth is struggling with an environmental disaster. The tale plods forward with multiple perspectives along with extensive ruminations. A middle of the road approach to terraforming ensues that eventually begins colonization of other worlds in the solar system: Venus, Mercury, asteroids, and eventually moons of the gas giants. Technology by Martian scientists permits more rapid space flight. A tentative treaty is established with Earth to permit limited immigration to Mars. The longevity treatment eventually begins to show its age with deadly consequences. Robinson continues his richly detailed environmental scenarios mostly on Mars, but also a bit on Earth. His command of nature and subsequent engineering projects is phenomenal. At the same time, there is much philosophical musing regarding economic and political systems that never seem to rise above undergraduate level discussions. It all seems to work out, but without any clear picture of why. Regardless of the situation on Earth, it's hard to believe the small Martian population could ever compete in terms of cutting edge science and technology, but they always do. The overall text is ponderous and in the end, there is mostly a muddle through result. The narration is excellent with a solid range of voices of both genders. Pacing is slow, but aligns up with the plot. I’ve absolutely loved this trilogy and am enthralled by Kim Stanley Robinson’s writing of the future. Definitely moving on to his other books and amazed at how much thought he puts into his futuristic writing and how life will work. just finished Kim Stanley Robinson’s Mars trilogy. I am in total awe at how incredible his science fiction writing is. His entire series was brilliantly written, throughly researched and outstandingly thought provoking. You’ll ride a wave of emotions as he forces you to ask questions and think deeply about life and death, relationships, the climate, politics, family, science, mathematics and so many other topics. I can’t recommend the Red Mars trilogy enough. Even if you aren’t fascinated by space and science, I promise you’ll laugh, cry, cringe while reading. Blue Mars, however is, in my opinion, the greatest of the three. Incredibly captivating. Very very good. In his books, Robinson creates a fictional reality, in which people are being people, humans with many facets, full and captivating. There's a fascinating mix of imagination and knowledge. So I love the Mars Trilogy. 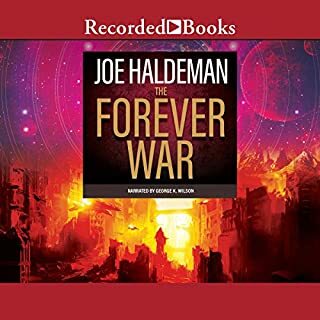 A little long winded at times, but overall an enjoyable end to the three book series. I read this trilogy when I was 16, and it captivated me. I loved every aspect of the science in this story. I would even say it was an influence on my career choice. Now I had the chance to relive it all again in audio form, being read to me. Now I'm older I understand the science much better, and the story is just as captivating, if not more so. An absolute must for any Sci-Fi Fan! Absolutely, the Third installment of the Mars Trilogy didn't disappoint me at all. This book has also aged remarkably well, with technology which is still as relevant and is looking ever more probably. The Story was evoking and had me completely enthralled. What was one of the most memorable moments of Blue Mars? I enjoyed the continued development of Mars in terms of Terra-forming, Ecology & Society. It was exciting to read about the increasingly distant relationship between Earth and Mars and the shifting balance of power in the Solar System. What does Richard Ferrone bring to the story that you wouldn’t experience if you had only read the book? Richard Ferrone gave an outstanding performance, with clear distinction between characters and a real sense of passion in the delivery. A truly magnificent story, and wonderfully narrated by Richard Ferrone. I highly recommend all the books in the Mars trilogy. I honestly dont know where to begin in how the imagination, research, and sheer vision of these books completely changed the course of my life. And as someone who retrained as a geoscientist as a result of this series, I dont say that lightly. Please, do yourselves a favour and take the time to listen to the messages within it. not the epic conclusion you would respect from a third novel on a series. read books one and two and stop.